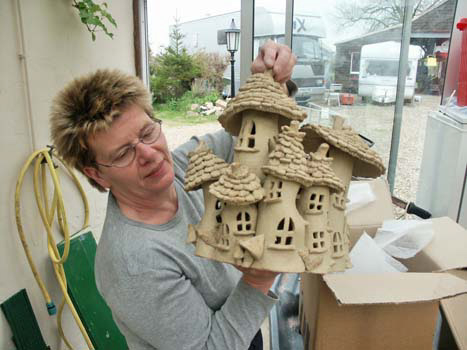 Fairy mushroom houses, hand crafted from stoneware clay in East Anglia. These are a range of mushroom / toadstool – inspired fairy houses. As darkness falls, theycan be illuminated* from within and cheer up a dark corner or nook in the garden, conservatory or house. Fairies are not supplied, but it is felt that the careful and attractive siting of the individual dwellings can soon encourage habitation. The shape and style of each one evolves as it is made, so no two are ever exactly the same. So far, planning consent has not been a problem…. We think they look very well in a dingley dell woodland setting, but we have seen some inspired and imaginative placings, on tree stumps, lovely firesides and quiet garden corners. If you are particularly chuffed with your placement, please send us a picture to (info@dingleydwellings.co.uk)and we will be delighted to add it to our gallery. *Please see “Safety” before lighting up – thankyou. Mushrooms range in size from 4″ (10cms) to over 30″ (75cms) in height. 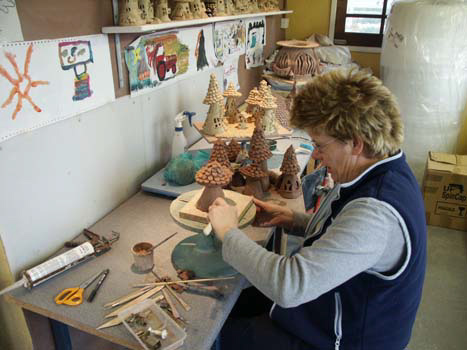 Each dwelling is made completely by hand from a “heavily grogged” stoneware clay. Part of the manufacturing process of this clay involves finely crushing up firebricks (or similar) and incorporating them into the mixture. This gives a rustic rough texture to the finished mushrooms and it is always gratifying to watch as people “just have-to touch” when we take them out to craft fairs – they are very tactile. The body and roof shape of each one is made first, it is then tiled with individual tiles, made from the same clay, first rolled into small balls, then flattened and overlaid (to shed the rain properly – and keep fairies dry) It is said that each tile carries the potters thumbprint! Then windows, doors and other features are added. (keyhole surgery) Once each piece is built, they are left to dry naturally to a state known as “leather hard” (This can be quite rapid in the summer – rather slower in the winter) Final stage is the firing – this can take up to two days from first closing the kiln door to finally re-opening again (always an unknown and can be a quite anxious time – especially with a large /complex dwelling) Any foreign particles in the clay, or sometimes,just the stresses built up in the making, can cause a piece to crack or even explode! The clay is taken up to 1260 degrees Centigrade and literally turns to stone. It becomes non-porus and frost resistant. RIGHT! I’VE BOUGHT A DINGLEY DWELLING – WHAT NEXT? Well, if you’ve a really large fairy mushroom house, it’s fairly safe to assume you already have a site in mind. They are perfect as part of a water feature by a pond. We’ve seen them with a background of tall reedy plants and with a small (pumped) rivulet passing by on its way back to the main pond. If lit, they will reflect in the surface of the water after dark and when viewed from the far bank give a magical doubling of the effect. They can of course, live inside and the giant dwellings can be found as a feature in unused fireplaces, again when illuminated, they provide an interesting focal and talking point in any room. Medium sized Dingley Dwellings will hold their own in the garden among the flowers and shrubs. A bit of judicious pruning as the season goes on may be required, just to prevent them being overgrown. A nice addition, is to sprinkle a small pebble path up to the front door. Any other small touches that show visitors that the fairies may be about are possible. We do have small washing lines and garden items for sale at the shows, but the only limit on such things is your imagination! Again, as always, the perfect siting may be inside the house or conservatory. Now we come to the tiddlers’ – if sited among the flowers and shrubs, these can be soon overgrown. We usually recommend siting the tiny dwellings among alpine plants or flowers that don’t grow too big. Alternatively, they look very well in a contained’ setting. We sell a matching Dingley’tray at the shows, but if you have available an old ceramic (Butler) sink or something similar. (Even an old tea tray that can be filled with sand/soil or moss) these are perfect. Within the tray or container the scale’ is easier to control. We usually have a tray set up at shows with a tiny dwelling at one end. It will have a pebble path up to the front door and all the small garden items, including washing line. Our own grandchildren love this format and this can all be re-arranged and played with quite safely by little fingers! We very much welcome our customers tips and suggestions and over the years have been pleased to take them ‘on board’ and will now share some of the very best. If you have any you would like to share with us, we’d love to hear them, please email. – info@dingleydwellings.co.uk Thank you in anticipation – Denise. Then place the dwelling over the “prong” – this should give a further level of security if the dwelling is knocked. Top tip – thanks! 2. We weren’t aware of this, but a lady customer with small children who had owned a dwelling for several years said that when her little ones lose their first teeth, instead of placing them under the pillow as is customary, the teeth are now placed beneath the dwelling. IT WORKS! In the morning the tooth is gone and in its place – a fairy payment! We’ve tried it with our grandchildren and can confirm this is the case – and it is so much easier for the fairies! (None of that fishing around beneath a pillow in the middle of the night!) Another top tip – thanks again! 4. To increase the effect of whichever type of lighting used, one customer suggested standing dwellings on an old C.D. This does work and reflects more of the light up inside, making the most of whatever system is chosen. Top tip once again – thanks…..